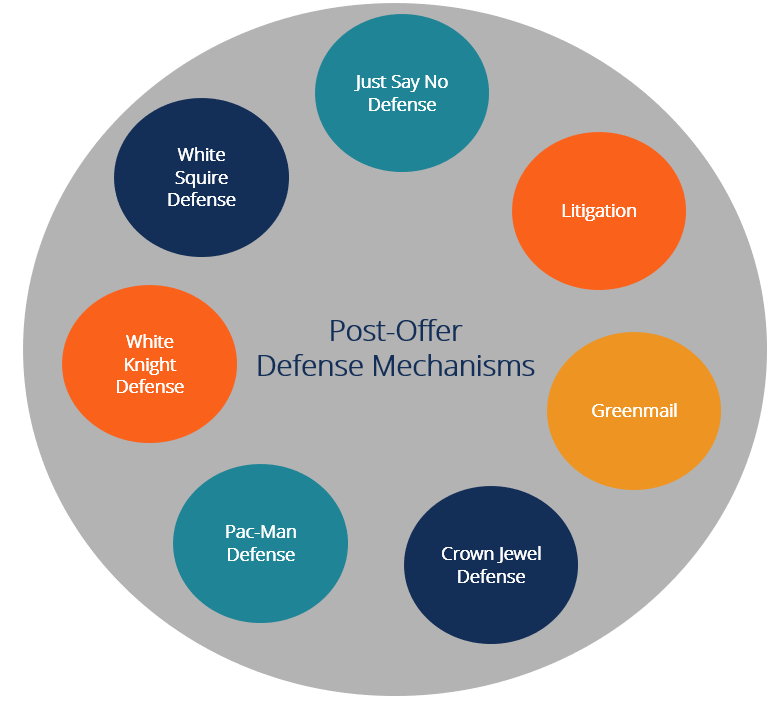 What is Post-offer Defense Mechanism? Post-offer defense mechanism is a term used to label a broad group of strategies that can be employed by a target company in a hostile takeoverHostile TakeoverA hostile takeover, in mergers and acquisitions (M&A), is the acquisition of a target company by another company (referred to as the acquirer) by going directly to the target company’s shareholders, either by making a tender offer or through a proxy vote. The difference between a hostile and a friendly after receiving a takeover threat. Unlike pre-offer defense strategies that define the preventive steps, post-offer defenses are executed when there is a real threat of a hostile takeover. The goals of the post-offer defense strategies are to delay a takeover in order to develop more efficient defensive mechanisms, make a target company less attractive to a bidder, or eliminate any acquisition possibility. in certain cases, when the management of a target company opposes the takeover deal, the managers may convince the members of the company’s board of directorsBoard of DirectorsA board of directors is essentially a panel of people who are elected to represent shareholders. Every public company is legally required to install a board of directors; nonprofit organizations and many private companies – while not required to – also establish a board of directors. that the upcoming deal will not be beneficial to the company’s shareholders. Another example of a post-offer defense mechanism. When a target company receives an offer, it can start a litigation process against the corporate raider. The success of the process depends on factors such as anti-competition laws in the jurisdiction or the presence of sufficient evidence. Even with the chances of success are low, the litigation process can still be employed to delay a potential hostile takeover. During this time, a target company may develop a more thorough defensive strategy. GreenmailGreenmailCommitting Greenmail involves buying a significant number of shares in a target company, threatening a hostile takeover, and then using the threat to force is a practice when a corporate raider’s already acquired a substantial number of shares, but a target company buys back shares at a significant premium. The main purpose of the crown jewel defenseCrown Jewel DefenseA crown jewel defense strategy is when the target company sells off its most valuable assets to reduce its attractiveness to the hostile bidder. A crown jewel defense is a mergers & acquisitions (M&A) takeover defense strategy where the target company sells off its most attractive assets so the acquiring company is to make a target company less attractive to a potential acquirer. Essentially, in this takeover defense strategy, a target company sells off its most valuable assets to a third party or spins off into an independent entity. In Pac-Man defensePac-Man DefenseThe Pac-Man Defense is a strategy used by targeted companies to prevent a hostile takeover. This takeover prevention strategy is implemented by the target company turning things around by trying to take over the acquirer. The purpose of the Pac-Man Defense, as with any defensive strategy against a hostile takeover, is to make a takeover very difficult Example of pac-man defense, a target company is willing to flip over the situation by attempting to purchase its potential acquirer. The Pac-Man defense is rarely used as the nature of the strategy implies that both companies are of equal size. For example, a small target company cannot use this strategy because it will simply not have enough funds to acquire its raider. When a target company receives a takeover threat, it may invite its strategic partner called a white knight to purchase a controlling interest in the company. In other words, instead of a merger with a corporate raider, the target company merges with its strategic partner. Generally, the white knight defenseWhite KnightA white knight is a company or an individual that acquires a target company that is close to being taken over by a black knight. A white knight takeover is the preferred option to a hostile takeover by the black knight as white knights make a 'friendly acquisition' by generally preserving the current management team is the last mechanism to avoid a hostile takeover. Additionally, it may create benefits to the shareholders of a target company through synergies between the companies. However, it is not always the case, as the synergies do not always materialize. The white squire defenseWhite SquireA white squire is an individual or company that buys a large enough stake in the target company to prevent that company from being taken over by a black knight. In other words, a white squire purchases enough shares in a target company to prevent a hostile takeover. is a variation of the white knight defense. In the defensive strategy, a target company asks its strategic partner called a white squire to obtain a minority interest in a company. Although the interest is not sufficient to control a company, it is adequate to fend off a corporate raider. Similar to the white knight defense, the white squire strategy is the last defense that can help a target company prevent a hostile takeover.